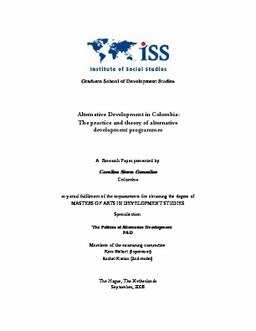 This paper analyses how alternative development programmes have been established in Colombia as a strategy to eliminate coca crops, this based on a central question; to what extend alternative development programmes are compatible with the discourse of alternative development? In order to answer this question, Chapter Two presents a theoretical framework which contextualises the beginning of alternative development in Colombian and its implications along the period as a counter point of mainstream development taking into account the elements such as empowerment, participation, gender , environment to assess alternative development. Chapter Three illustrates the use of alternative development approach as anti-drug policies and its practices in other countries. Chapter Four exemplifies four cases of alternative development programmes in Colombia located in the areas of Sierra Nevada de Santa Marta, Urabá region and Guaviare. Chapter Five presents a general analysis of the research paper focusing in answering the central question based on the elements used to assess alternative development programmes and their relations with the practices in other countries following by the final conclusions of the paper.